The caramel equivalent of slipping into satin sheets. 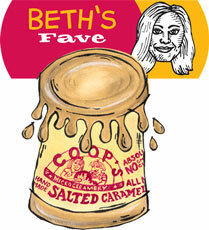 Beth Holloway is a supervisor in our Service Center at Zingerman's Mail Order. A friend of mine said it best after her first taste of Coop's Salted Caramel Sauce: "Oh my god... this is what I always wanted salted caramel to be, but it never was... but now it is!" I shared my jar with her, and we ran out of clean spoons. It worked out okay, you can always substitute a butter knife for a spoon. Just to gild the lily, we even drizzled a little on top of some dulce de leche gelato. At the end of the evening, when I asked my friend if she'd like to take a jar home with her, she resisted for all of about two seconds before snatching it up. I bet there aren't any clean spoons at her house now, either. "A perfect sweet-salty balance and an impossibly smooth texture."